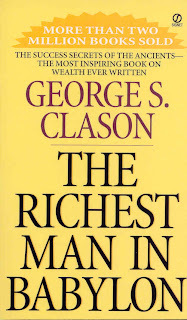 It has been a challenging week, but I managed to get my book done, The Richest Man in Babylon by George S. Clason. This classic is a favorite of many of my preferred authors, so I thought I would add it to my repertoire. Clason is a fascinating man, born in Louisiana, Missouri in 1874 and started his Babylonian-based writing in 1926. This book has very solid messages and it's no wonder why this book has become a finance classic. Clason uses parables set in Babylon to make his points throughout the book. One chapter does a really great job of encompassing several financial points, The Five Laws of Gold. Each of the five laws are very simple and if used can work wonders in building your wealth. 1: Gold comes gladly and in increasing quantity to any man who will put aside 10% of all he earns to build an estate for his family and future. 2: Gold labours diligently and contentedly for the wise owner who finds it profitable employment. 3: Gold clings to the protection of the cautious owner who invests it under the advice of men wise in its handling. 4: Gold slips away from the man who invests it in businesses that he is not familiar or is not approved by those skilled in its keep. 5: Gold flees the man who would force it to impossible earnings or who follows the advice of tricksters or schemers or who trusts it to his own inexperience and romantic desires in investment. I feel Law 1 is the most useful thing anyone can use when starting to accumulate wealth. I have touched on this in a couple blog posts, but I want to really drive it home. The best way for you to really start making a large sum of money is Paying Yourself First. YOU is the most important investment your have. YOU should have the mentality that YOU are your most vicious creditor you have. You owe YOURSELF before you pay anyone else.... Figure it into your budget. When you get your paycheck have a set number each month that you owe YOURSELF, I like no less than 10%. Never budge on paying yourself and always do it first. In my last blog about I Will Teach You To Be Rich, I showed you how to automate your finances. This makes it very easy to pay yourself. If you have $500 a month coming out of your checking account, and into your ING Direct or Emigrant Direct Savings Account, the day after you get your paycheck, you won't even consider that spending money. ING and Emigrant Savings Account pay 1.3% interest right now and it takes a day or two to get money when you do a transfer. I definitely recommend either of these accounts. I challenge you to start paying yourself first... trust me, you are worth every single penny. PAY YOURSELF FIRST! More on ING and Emigrant Direct Accounts.... I just changed from Emigrant to ING because ING allows you to have several sub-accounts under the same over arching account. You can create nicknames for each of your accounts and each can have automatic savings plans for each separate account. Let's play pretend... You have and ING Account with sub accounts named Wedding, New House, and Vacation (I will discuss retirement accounts in a separate blog down the road... saving accounts should be used for short-term expenses: 3-6 years). You want to Pay Yourself First so you have get paid on the 1st each month and on 2nd you have ING pull $500 from your checking account. This $500 will be split among your accounts $150 to Wedding, $250 to New House, and $100 to Vacation.... In 5 Years we will have... drum-roll... $9,294 for your Wedding, $15,490 for your New Home, and $6,196 for your dream vacation... Total Savings = $30,980. Determine what you want you pay to be and work your budget so you pay yourself before anyone else... be vicious... get creative and figure out a way to pay yourself what you want. I want to make a point that much more money can be accumulated than this for the long-term... More on that later. The Richest Man in Babylon is a great book with lots of great parables. It's not a long read just some different language usage. I think it would be a good read for anyone that has a little extra time... probably a vacation read... in 5 years you'll have plenty saved up for that! If you have any questions on the book don't hesitate to ask. I would be more than happy to help anyone that wants it.